The song begins with, “On the first day of Halloween, my good friend gave to me: a vulture in a dead tree.” You can only imagine where it goes from there: hissing cats, fat toads, giggling ghosts, cooked worms, and so-on; until, “On the thiteenth day of Halloween, I invited my good friend to tea, and I gave HIM a present. A real, live …” and this is how it ends: with a big, fat question mark. Raglin’s illustrations are eerie and completely complimentary to this imaginatively-creepy and lots-of-fun sing-a-long book. He has conjured up a classic, spooky crew to portray the books troupe of ghosts and ghouls, who certainly bring energy and entertainment to Greene’s inventive parody. The guessing-game-ending took me by surprise, but it sure makes for a good conversation — or even an introduction into Pandora’s box. Spooktacular! wrote her first poem when she was six years old (it was about a spider). To date she has published over a hundred books for children. Carol also likes to read, sing, and make teddy bears. She lives in Webster Groves, Missouri, with her cat Dulcie. 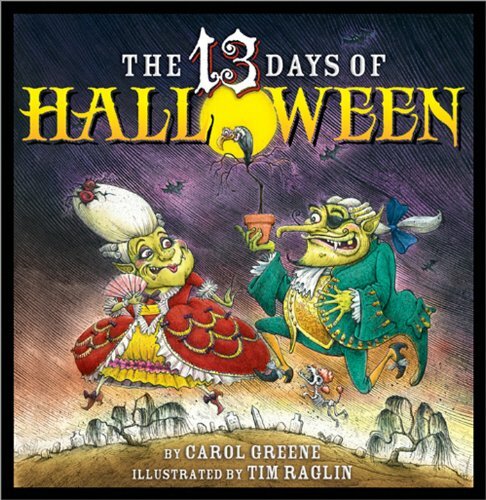 About the Illustrator: Tim Raglin brings his wacky imagination and wonderfully odd cast of characters to The Thirteen Days of Halloween. His previous books include Five Funny Fights, Pecos Bill, and The Birthday ABC. He received a silver medal from the New York Society of Illustrators for his book Uncle Mugsy & the Terrible Twins of Christmas. Mr. Raglin lives in his hometown of Independence, Kansas.